Kent State University Libraries are excited to announce the addition of BrowZine to our online resources. BrowZine offers users a sleek, easy to use, mobile digital environment to explore journals. 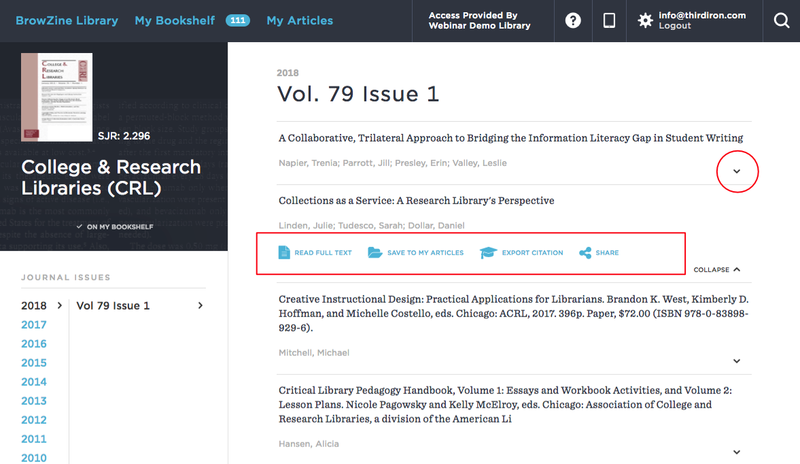 You can search by journal title or browse by subject and you can create a personalized digital journal bookshelf to which you can download articles from your favorite journals for later reading offline. You can also receive alerts when new articles become available. BrowZine offers apps for iOS and Android, as well as a website and you can synchronize your reading experience between home, the office, and your mobile devices. See also: Link to mobile app downloads page. What is included in BrowZine? BrowZine is used to explore, browse, and bookmark (bookshelf) academic journals. It is particularly useful as a mobile-friendly platform to explore your favorite journals. BrowZine has the contents of most of the Kent State University academic journal collection from 2005 to the present. If BrowZine cannot locate a resource you will automatically be directed to our traditional journal location tool to check for subscription information. Click the down arrow in an article record in BrowZine web. This will expand to reveal 4 additional tools you can use to make your e-journal research life easier. 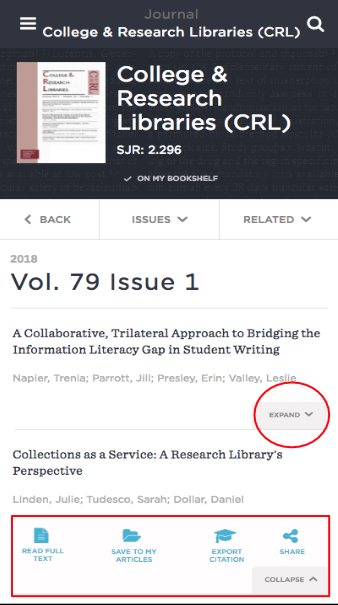 "Read full text" takes you directly to the article, or to an alternative means of getting it if your library doesn't have it. "Save to my articles" lets you save articles for reading later when it's convenient. This is an integral part of staying up to date and is used heavily by the most organized researchers. "Export citation" sends the citation directly to your preferred citation tool. Never again lose an article you need, and get instant organization. "Share" the article link directly to Twitter, Facebook, and LinkedIn. Or email it to a colleague. Content provided by Third Iron, LLC.